Michael Channing dives over for a try in his Castleford Tigers days. Former Castleford Tigers and Featherstone Rovers player Michael Channing has been forced to retire at the age of 26 due to a neck injury. The Wales international centre first suffered the injury three years ago and has hung up his boots now after receiving medical advice. 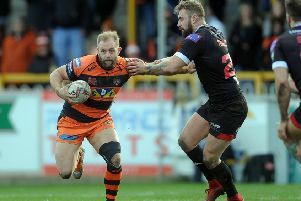 Channing started at London Broncos before spending three seasons in Super League with Castleford and a year at Featherstone. He then moved back to London and has helped them to reach the Million Pound game. On the reasons for his retirement, he said: “I’ve been forced into early retirement through a neck injury I sustained around three years ago. “With the advice of the best in the country and all the medical care under the sun, I’m sure we’re making the right decision. “I will forever be grateful to be one of the lucky ones who got to live out their childhood dreams. I’ll be the first person to admit I was never a ‘star’ of the game and my inconsistency as a player would explain why I didn’t manage to re-sign an expired contract. However, the time I did spend at each club were the best years of my life to date. Over my short career I’ve experienced some unbelievable moments that I will cherish forever and talk about to my kids (when I have them) – a World Cup in Australia, reached the Challenge Cup final in Wembley and played with and against the worlds best. “I’d like to thank Castleford, Featherstone and London Broncos for everything they have given me and to every single member of staff, fans and players within my years I was there.